Uganda's ruling party has endorsed President Yoweri Museveni as its candidate for the 2021 elections. This means the 74-year-old leader, who came to power in 1986, will be running for a sixth term. 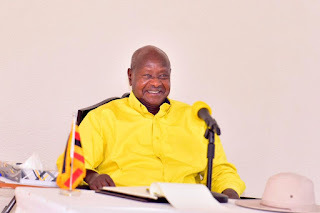 The National Resistance Movement (NRM) agreed, in a meeting chaired by Mr Museveni on Wednesday, that he should "continue leading the movement and the state in 2021 and beyond to eliminate bottlenecks to transformation". Mr Museveni once said leaders who "overstayed" in office were the root of Africa's problems. However, he said, while running for a fifth term in 2016, that it was not the right time for him to leave as he still had work to do. His candidacy for Uganda's next election comes after he signed a 2017 bill that scrapped the presidential age limit of 75.